Three Autograph Letters Signed by Ramsden to Cuming Walters, with two printed documents, relating to an address given by Cuming Walters to the Heywood Fellowship on 'Brotherhood Sunday'. It is a singular circumstance that no information whatsoever is available on the Heywood Brotherhood (whose President was the Reverend F. Gordon Mee) on the internet. The five items clear and complete on lightly-aged paper. All leaves of the three letters on the Brotherhood's letterhead (featuring the names and addresses of five of its officials). Letter One (2 pp, one 8vo and one 12mo, with small ink stain at head of first leaf): 18 November 1930. Ramsden asks to 'have the subject of the address you propose to give at our "Brotherhood Sunday" on Sunday, Nov. 30/30'. Wonders whether Cuming Walters would like to 'take part in the procession' and the following tea. Letter Two (8vo, 1 p):: 24 November 1930. Not having received a reply to his last, renews the questions posed in it. Describes the meeting, 'for men only'. 'Your Chairman will be Counc. B.C. Leigh, of Heywood; representatives from the "Buffs", Rechabites, St. John Ambulance Brigade, Ex-Service men, Police Force, "Unemployed Workers", will be present and we are anticipating the presence of our Mayor and Corporation.' Gives details of the planned parade. Letter Three (2 pp, one 8vo and one 12mo): 25 November 1930. Having received Walters' reply (delayed by indisposition) he has 'been able to include the subject of your address on our printed programme'. Gives directions to Heywood from Manchester. 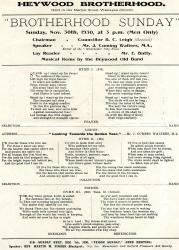 Item Four: Programme, printed on one side of a pink-paper 8vo, for the Brotherhood's 'Open ANNIVERSARY MEETING', 23 November 1930. with words of hymns to be sung, and names of parties. The following week's 'Brotherhood Sunday' advertised at foot, with 'Speaker, Mr. J. CUMING WALTERS, M.A. (Editor, "Manchester City News.")' 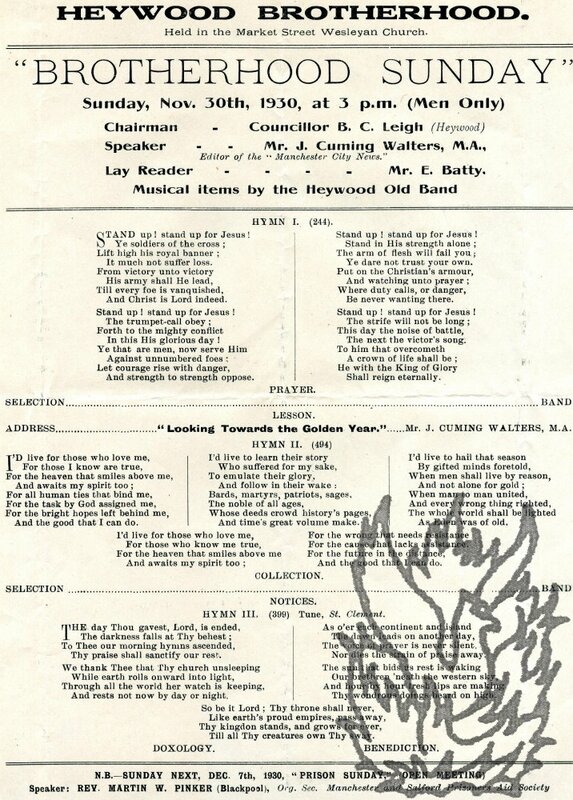 Item Five: Programme, printed on one side of a cream-paper 8vo, for the 'Brotherhood Sunday'. With words of hymns and details of parties, including 'ADDRESS........"Looking Towards the Golden Year."........Mr. J. CUMING WALTERS, M.A.' Also present is a copy of Ramsden's card, damaged, but with text complete. From the Cuming Walters archive.